On this episode of RPG Lessons Learned: A pocket of undead have awakened beneath Sandpoint. On this episode of RPG Lessons Learned: The guys recap and go in-depth on their last ETU session and what made it so great. 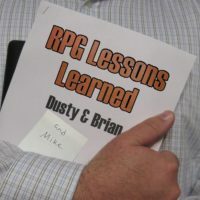 On this episode of RPG Lessons Learned: Dusty’s been taking notes as a player… and it’s been a game-changer for him! Mike and Brian share their tips and tricks for staying engaged. On this episode of RPG Lessons Learned: It’s over. We just wrapped up our East Texas University game in Savage Worlds, and we immediately fired up the recorder to do a post-mortem. It’s a rare show with everyone from our table! This week we’re joined by Chris and Nathan! RPG Lessons Learned 070 – WTH Happened to our Game? On this episode of RPG Lessons Learned: Why haven’t we played in six weeks?